At its June meeting, the Board of Trustees of the Sikeston Public Library recognized three of its members as their terms as trustees expired. Lew Polivick (left) served six years on the board, serving the past two years as president. Carolyn Tetley (center) also served six years on the board, including the past four years as treasurer. Dr. Larry Bohannon (right) served eight years on the board, including the past two years as vice president. 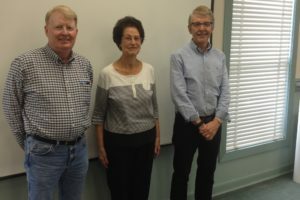 Between the three, they have served 20 years as trustees, guiding the library through day-to-day operations as well as the remodeling of the lower level of the library. The terms of three trustees end on June 30. We appreciate their service to the library!